Not to be confused with Western wear. It has been suggested that Costume de rigueur be merged into this article. (Discuss) Proposed since January 2019. Western dress codes are dress codes in Western culture about what clothes are worn in what setting. 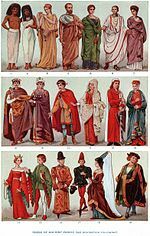 Classifications are traditionally divided into formal attire (full dress), semi-formal attire (half dress), and informal attire, with the first two sometimes in turn divided into day and evening wear. A level below these are sometimes referred to as casual attire, often in combinations such as "smart casual" or "business casual" in order to indicate higher expectation than none at all. The more formal traditional Western dress code interpretations - that is formal i.e. "white tie" and semi-formal i.e. "black tie" - have remained highly codified for men with essentially fixed definitions mostly unchanged since the 20th century with roots in 19th century customs. For women, though, changes in fashion have been more dynamic. Yet, although casual inventions, combinations and reinterpretations of the classifications have occurred and fluctuated, the general formal traditions have persisted for more than a century. Dress codes are sometimes explicitly instructed, expected by peer pressure, or followed intuitively. As with other cultures, versions of ceremonial dresses, military uniforms, religious clothing, academic dresses, and national dresses appropriate to the formality level are generally permitted and worn as exceptions to the uniformity, often in the form of headgear (see biretta, kippah etc.). Conversely, since most cultures have at least intuitively applied some level equivalent to the more formal ones in Western dress code traditions, the latter's versatile framework open to amalgation of international and local customs have influenced its competitiveness as international standard range from formal to casual. The background of traditional contemporary Western dress codes as fixed in 20th century relied on several steps of replacement of preexisting formal wear, while in turn increasing the formality levels of the previously less formal alternatives. Thus was the case with the ceasing of the justacorps, extensively worn from the 1660s until the 1790s, followed by the same fate of the 18th century frock (not to be confused with frock coat), in turn followed by the frock coat. Before the modern system of formal, semi-formal, and informal was consolidated in the 20th century, the terms were looser. 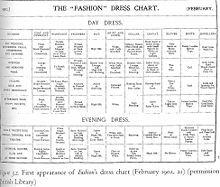 In the 19th century, during the Victorian and Edwardian periods, the principal classifications of clothing were full dress and undress, and, less commonly the intermediate half dress. Full dress covered the most formal option: frock coat for day attire, and dress coat (white tie) for evening attire (sometimes with supplementary alternative being a full dress uniform independent of what time of the day). Today's semi-formal black tie (originally dinner clothes) was initially described as informal attire, while the "lounge suit," now standard business attire, was originally considered (as its name suggests) casual attire. Half dress, when used, was variously applied at different times, but was used to cover modern morning dress (note that the term morning dress is fairly undescriptive and has not always meant modern morning dress). Undress (not to be confused with naked) in turn was similarly loose in meaning, corresponding to anything from a dressing gown to a lounge suit or its evening equivalent of dinner clothes (now one of the more formal dress codes seen in many Western regions). Ladies and gentlemen in formal morning dress wear (1929). President Ronald Reagan in a formal evening dress coat ("white tie"), and brother Neil Reagan in a dinner suit i.e. tuxedo ("black tie") (1981). Please note that the definitions listed above are the strict, traditional definitions, which may not be followed in common use. For example, formal is often used to mean any of the first three, and informal to indicate what is classified here as casual. Typical events: Weddings, state dinners and affairs, formal balls, royal events, etc. Note that the use of white tie and morning dress has become rare in some countries (such as the United States and Australia), where black tie or a lounge suit (as appropriate) is often worn to the above events. Typical events: Theatre opening nights, charity balls, etc. There is some variation in style depending on whether it is summer or winter. See black tie and stroller for more details. In the last few decades, in place of the traditional white tie or morning dress, black tie has been increasingly seen in the United States at formal day wedding. However, etiquette and clothing experts continue to discourage or condemn the wearing of black tie as too informal for weddings, or any event before 7 p.m., such as by Emily Post (1872-1960) and Amy Vanderbilt (1908-1974), the latter arguing that "no man should ever be caught in a church in a tuxedo." Business wear is included in the informal category, generally consisting of a business suit and tie. Informal dress code encompasses all suits, but not all suits are considered business appropriate in fabric, cut, or color. Casual attire, although not traditionally part of Western dress codes, are sometimes applied colloquially. Related to this category is business casual, smart casual, etc. ^ Kent State University Museum (2002). "Of Men & Their Elegance". Retrieved 2008-11-02. Sondag, Glen (2011). Anything Other Than Naked. London Street Press. pp. 200 pages. ISBN 1-936183-83-8.